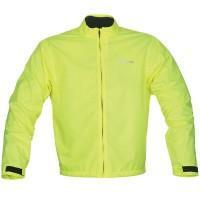 Make sure you can be seen throughout the darker nights with these High Visibility jackets. Bad things happen at night – vampires rise, Bigfoot lurks, mysterious shadowed-figures appear and crawl out of your TV...but the biggest worry for bikers and their relatives will forever remain being hit by other road traffic. Sadly, this sort of thing happens every day – keep yourself visible when riding after dusk with these cost-effective Hi-Vis jackets. It could just save your life. This full high-visibility waterproof overjacket will not only keep you in the driver’s eyeline, but also keep you strangely stylish. With a reflective Richa logo, you can also parade your stuff up and down the pavement like a fashionista. 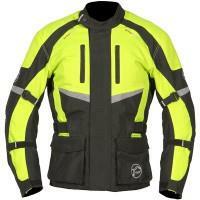 This waterproof Hi-Vis jacket fits over the rider or rider & rucksack – keeping you and your stuff dry. No more wet maps, soggy sandwiches or water-logged electricals! 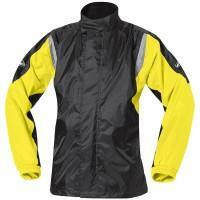 Here we have a waterproof jacket with CE approved armour and quilted thermal liner. So, it should keep you warm as well as safe – making it the perfect hybrid. A bit of cold won’t stop you now! Available in a choice of two colours – Black or Neon Yellow – the Buffalo Waterproof textile jacket has a removable quilted liner for days where the weather improves and you are left cooking form within. 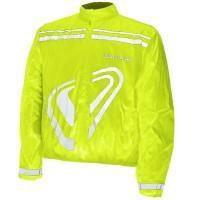 Looking for a waterproof jacket with Scotchlite reflective elements? 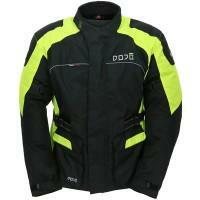 This is the high-visability jacket for you! Available in yellow or black.